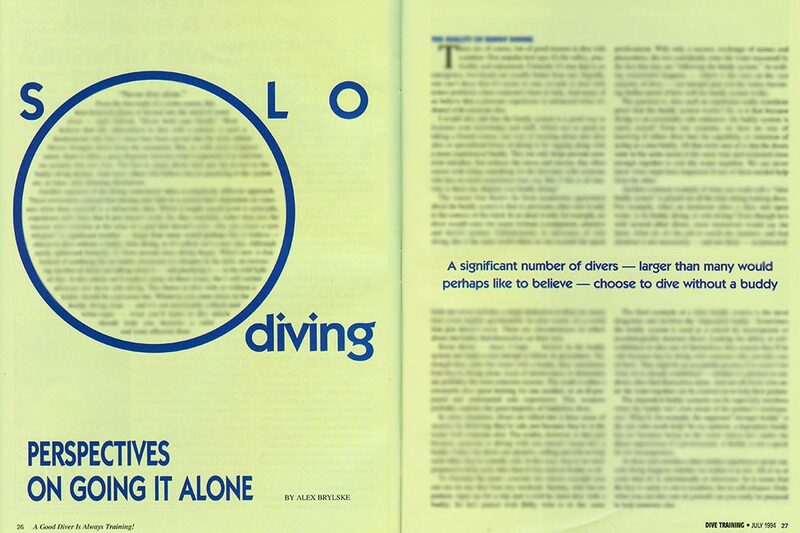 Publisher’s Note: This article, written by Alex Brylske in the July 1994 issue of Dive Training, offered another perspective on a fundamental rule of diving, ‘never dive alone.’ At the time, advocating for solo diving was not very popular although in reality it was being practiced by divers. Alex did a terrific job laying out the considerations on both sides. The article is timeless in its approach to the subject, especially with the reminder that without the proper attitude, training and approach, even with a buddy we might be diving alone. Content below originally published in Dive Training, July 1994. “Never dive alone.” From the first night of scuba course, this time-honored phrase is burned into the mind of every diver — right behind, “Never hold your breath.” Most believe that this admonition to dive with a partner is such a fundamental rule that it must have been carved into the stone tablets Moses brought down from the mountain. But, as with most religious tenets, there is often a great disparity between what’s expected of us and how we actually live our lives. The fact is, many divers only pay lip service to the buddy diving dictum. And many others who believe they’re practicing it like zealots are, at times, only deluding themselves. Another segment of the diving community takes a completely different approach. These revisionists contend that placing your faith in a system that’s dependent on someone other than yourself is a fallacious idea. While it might sound good in principle, experience tells them that it just doesn’t work. So, they conclude, rather than join the masses who worship at the altar of a god that doesn’t exist, why not create a new religion? A significant number –larger than many would perhaps like to believe—choose to dive without a buddy. Solo diving, as it’s called, isn’t a new idea. Although rarely addressed formally, it’s been around since diving began. What’s new is that instead of confining the no-buddy discussion to whispers in the dark, an increasing number of divers are talking about it—and practicing it—in the cold light of day. In this article we’ll explore many of these issues, but I will neither advocate nor decry solo diving. The choice to dive with or without a buddy should be a personal one. Wherever you come down on the buddy diving issue—and it’s not necessarily a black-and-white-topic—what you’ll learn in this article should help you become a safer and more effective diver. There are, of course, lots of good reasons to dive with a partner. One popular text says it’s for safety, practicality and enjoyment. Certainly it’s true that in an emergency, two heads are usually better than one. Equally, one can’t deny that it’s easier to stay on task or deal with minor problems when someone’s there to help. Andy many of us believe that a pleasant experience is enhanced when it’s shared with someone else. I would also add that the buddy system is a good way to increase your knowledge and skill. Albeit not as good as taking a formal course, one way of learning about new dive sites or specialized forms of diving is by tagging along with a more experienced buddy. This not only helps prevent common mistakes, but reduces the stress and anxiety that often comes with doing something for the first time with someone who has no more experience than you. But if this is all true, why is there any dispute over buddy diving? The reason that there’s far from unanimous agreement about the buddy system is that its advocates often view it only in the context of the ideal. In an ideal world, for example, no diver would enter the water without a competent, attentive and dutiful partner. Unfortunately, to advocates of solo diving, this is the same world where no one exceeds the speed limit and never includes a single deduction on their tax return that’s even slightly questionable. In other words, it’s a world that just doesn’t exist. There are circumstances in which divers inevitably find themselves on their own. Some divers — most, I hope — believe in the buddy system and make a real attempt to follow its procedures. Yet, though they enter the water with a buddy, they sometimes find they’re diving alone. Lack of attentiveness or distraction are probably the most common reasons. The result is either a miserable dive spent looking for one another, or an ill-prepared and unintended solo experience. This scenario probably explains the great majority of buddyless dives. In some situations, divers are lulled into a false sense of security by believing they’re safe just because they’re in the water with someone else. The reality, however, is that just because someone is diving with you doesn’t mean he’s a buddy. Unless the divers are attentive, willing and able to help each other, they’re actually solo. In this case, they’re no more prepared to help each other than if they had no buddy at all. To illustrate the point, consider the classic example you can see on any dive boat any weekend. Sammy, who has no partner, signs up for a trip and is told he must dive with a buddy. So he’s paired with Billy, who is in the same predicament. With only a cursory exchange of names and pleasantries, the two confidently enter the water reassured by the fact that they are “following the buddy system.” As nothing remarkable happens—which is the case on the vast majority of divers—our intrepid pair exit the water, becoming further proof of how well the buddy system works. The question is, does such an experience really constitute proof that the buddy system works? Or, is it that because diving is an essentially safe endeavor, the buddy system is rarely tested? From our scenario, we have no way of knowing if either diver had the capability or intention of acting as a true buddy. All that we’re sure of is that the divers were in the same ocean at the same time and remained close enough together to exit the water together. We can never know what might have happened if one of them needed help from the other. Another common example of what you could call a “false buddy system” is played out all the time during training dives. For example, when an instructor takes a class into open water, is he buddy diving or solo diving? Even though he’s with several other divers, most instructors would say the latter. After all, it’s his job to watch the students, and that attention is not necessarily—and not likely reciprocated. The final example of a false buddy system is the most dangerous and involves the “dependent buddy.” Sometimes the buddy system is used as a crutch by incompetent or psychologically insecure divers. Lacking the ability or self-confidence to take care of themselves, they assume they’ll be safe because they’re diving with someone who can take care of them. That might be acceptable practice if it weren’t for what we’ve already established—whether it is planned or not, divers often find themselves alone. And not all divers who enter the water together can be counted on to help their partner. The dependent buddy scenario can be especially insidious when the buddy isn’t even aware of his partner’s inadequacies. What if, for example, the supposed “stronger buddy” is the one who needs help? In my opinion, a dependant buddy has no business being in the water unless he’s under the direct supervision of a professional. A buddy is not a quick fix for incompetence. As these and countless other similar experiences point out, solo diving happens whether we realize it or not. All of us at some time do it, intentionally or otherwise. SO it seems that the key to safety is not in numbers, but in self-reliance. Only when you can take care of yourself can you really be prepared to help someone else. Even divers who would never consider entering the water alone should be self-reliant this has both practical and psychological benefits. On the practical side, a self-reliant diver is one who can handle problems even if his buddy isn’t around or paying attention to him. To a self-reliant diver a buddy is an aid, not a necessity. From a psychological standpoint, a self-reliant diver is also a self-confident diver because he knows, buddy or no buddy, he can handle whatever problems might arise. This translates into less apprehension and anxiety. The benefits are a reduced breathing rate, lower threshold of panic and improved ability to pay attention to the dive and his buddy. But what is a self-reliant diver? Most training organizations have special short-duration programs designed specifically to refresh your skills and knowledge. So if you’re uncomfortable performing any of the skills listed, that’s a good indication that you should enroll in one of these courses. Skill competence also implies some familiarity with self-rescue and the ability to offer assistance to others. Remember, the willingness to help your buddy is meaningless if you lack the know-how to do it. But such knowledge and skill doesn’t just materialize out of thin air. To gain these insights, solo divers and buddy divers alike should take a rescue course. The second requirement of self-reliance is that you maintain a reasonable level of physical conditioning. While we could devote an entire discussion to just this issue, there are some simple ways you can determine what’s “enough.” Start by reviewing the kinds of environmental conditions you usually encounter. Do you normally dive in heavy or moderate currents or surf? At what depths and temperatures? Do you dive in open ocean or in a lake or quarry? And how likely is it that these conditions will change from day to day, or even hour to hour? Your physical condition must match, or better yet, exceed the conditions you dive most often. What this means, of course, is that someone who divers primarily on the shipwrecks of the northeast U.S. needs more physical stamina than someone who confines his diving to the freshwater springs of northern Florida. And while only you can make the final determination of what kind of condition you need to maintain, there are some good general guidelines to get you going in the right directions. One tried-and-true exercise program comes from the father of aerobic conditioning himself—Dr. Kenneth Cooper. His book, The Aerobic Program for Total Well-Being, is an excellent guide to conditioning. Thirdly, and perhaps most importantly, a self-reliant diver must understand and accept his limitations. This can be more difficult than it sounds because it requires a great deal of something many of us lack—self=honesty. We all have an internal vision of ourselves, and sometimes that vision belies reality. I’m not saying that there’s anything wrong with a positive self-image. Quite the contrary. But as divers, when that self-image is overblown, the result can be downright dangerous. Let me explain by a personal example. I’d like to believe that I possess the same stamina and physical prowess I did when I was and 18-year-old jock. But realistically, I know I don’t. And lying to myself could mean getting into circumstances I can’t handle. But as most of you baby-boomers with a realistic self-image, I’ve managed to compensate for my lack of youth and brute strength by learning to use my brain and some basic common sense. This lets me honestly assess diving conditions and make the appropriate decisions. If I believe that I might get in over my head (figuratively, at least), then I’m wise enough not to dive. After all, diving is a recreational endeavor, not a test of muscle and testosterone. The outcome from such a self-assessment is that when you do decide to make a dive, it will be with a high degree of psychological and emotional confidence—the final measure of a self-reliant diver. WHY NOT DIVE WITH A BUDDY? What we have discussed so far gives equal value to both buddy and solo divers. The question still remains, particularly for buddy divers, why would anyone intentionally dive alone? To solo divers, the reasons are numerous. First, there are the practical reasons. Solo divers contend that there are some diving activities that not only lend themselves to diving alone, but for which solo diving enhances the experience. For example, the last thing in the world an underwater photographer wants—unless, of course, he needs a model—is someone else tagging along scaring the marine life and destroying visibility. Adding credence to this is the fact that virtually all professional underwater photographers dive alone when there is no need for a model. And even in those situations where there’s someone else accompanying him, you can rest assured that for all practical purposes the photographer is solo diving. His attention is devoted completely to getting pictures, not watching another diver. Like photographers, underwater hunters often prefer to go it alone. Many lobster divers look at buddies as nothing more than competitors for a limited resource. And having a buddy means that they’ll give away the location of their special spots and successful techniques. Spear fisherman, likewise, usually feel the same way about buddies. But they add that it’s a lot safer to dive without a buddy because a partner risks becoming an accidental target, particularly in limited visibility. Another reason some choose to dive alone is simply because they don’t want to take responsibility for someone else. Ironically, many consider anyone who would dive solo as totally irresponsible. But in my experience, most true solo divers are more responsible than many buddy divers I know. This is because a lot of careful consideration, planning and self-sufficiency is essential to become a proficient solo diver. Yet another reason for diving buddyless is a practical one—there’s just no one else to dive with. There are lots of places where diving isn’t a popular activity. Not having someone to dive with is, in fact, one of the primary reasons the diving industry points to in explaining why some people drop out of diving. While I can’t endorse the practice of solo diving for that reason alone, it’s also difficult to rebuke those who do. The final reason for going it alone may be the most compelling—the solitude. While there’s a lot to be said for sharing the experience, solo divers often feel that diving is best appreciated in complete isolation from others. It is, after all, the silent world, and some feel that the accompaniment of another diver is nothing but an intrusion. I’ve seen so better summation of this point than the one expressed by author and world-famous free diver, Carlos Eyles. According to him, “I may enter the ocean with another, but we soon part and go our own way. His ocean is not my ocean, his comfort zone is not my comfort zone. The secrets I have were given to me because I went alone, and in the silence of myself I could hear them. Such secrets are not, cannot, be given when in the company of others, nor can they be seen or heard without a fearless heart and quiet mind…It has been said that the exploration of value is of one’s self. If that is true, then I have no better teacher in life than the ocean. Solo diving is often misinterpreted to mean nothing more than jumping in the water without a buddy. That’s not solo diving, that’s diving by yourself. There is an enormous difference between the two. Because he has no one else to fall back on in case of a problem, a true solo diver follows a planning routine that is often more rigorous than most buddy divers. In addition to the standard pre-dive preparation, he’ll follow a set of special rules and considerations. Perhaps the most important rule for solo diving is that the diver have past experience in similar diving conditions. In other words the dive isn’t beyond his level of experience and his personal comfort zone. This applies not only to the conditions present at the time he enters the water, but also consideration for how those conditions might change during the course of the dive. It’s one thing to enter the water on a bright, calm day with no current, but if the weather or tide changes, there won’t be anyone around to help. If in the planning process the diver determines that he can handle the dive only if conditions remain stable, that’s a good indication that he should abandon his solo plan and make that dive with an experienced buddy. This is an excellent illustration of the need for self-honesty we discussed previously. Once in the water, perhaps the most important consideration is air management. Some suggest that the solo diver take the time to meticulously calculate his air requirements and probable air usage. My experience tells me that, except for the mission-oriented technical divers, divers rarely are willing to do this. A simpler and more practical planning guideline is to use something I’ve talked about in previous articles—the “rule of thirds.” This simple rule says that you should plan only one-third of you air supply for the trip out. Then, use another third for the trip back. The final third is a reserve for unforeseen circumstances which, when diving without a buddy, can be a particulary vital consideration. The next consideration is, what if you screw up your air management plan and run out of air? There will, of course, be no one around to give you an octopus or alternate inflation regulator (although a solo diver should still carry such a device if, for no other reason, in case he encounters a second-stage malfunction). The only out-of-air contingency that will work for a solo divers is a completely redundant aire supply, such as Spare Air or pony bottle. When making deeper divers, larger-capacity pony bottles or dual tanks with independent valves or separate regulators are essential. Ron von Maier, one of the few people who has written extensively about the subject, advocates two other common-sense rules for solo diving. The first is that one should never solo dive deeper than twice the depth to which he can free dive. This tends to impose a reasonable and personalized depth limit. My guideline would be a little different. As few people do much free diving anymore, it might be difficult for some to see this as a usable guideline. My suggestion would be to limit solo dive to a depth no greater than that from which you have preformed a controlled emergency swimming ascent. That way, you have the self-confidence of knowing that even without air you can make it to the surface, because you’ve done it before. Von Maier’s second rule is another sensible and practical one: A solo diver’s underwater distance from his exit point should not exceed the distance he can comfortably swim in full scuba while at the surface. Remember, getting to the surface is only half the battle. You also have to get out of the water, and there won’t be anybody to help you. All of the various certification organizations place great emphasis on the buddy system and require adherence to it during any training-related activity. Most dive operators and charter boats, likewise, insist that divers operate in pairs. These, I believe, are wise practices given that many—perhaps most—divers aren’t self-reliant to the degree I described earlier. I believe, the buddy system will, and should, continue to be a vital safety procedure for the vast majority of divers. And I certainly wouldn’t want to suggest to those who like sharing the diving experience with others to do otherwise. But we should also not lose sight of the fact that we live in a free society. And as there isn’t any governmental regulation on diving, there are no “scuba police” to enforce buddy diving or any other practice. If some divers want to solo dive, neither I nor anyone else can stop them. Even if they’re asked to enter the water with a partner, no one can control their behavior once they’re on the bottom. As I eluded to before, this issue is not black or white. Not all solo diving is dangerous and irresponsible, nor is it the panacea for all the problems divers face. Equally, I believe the buddy system has saved numerous lives when it’s practiced properly; but I’m not blind to the fact that when it’s put to the test, it doesn’t always work. An alarming trend in our society is the reluctance to accept personal responsibility for our actions. The credo seems to be: When something goes wrong, blame anyone or anything but ourselves. In reality, it’s not our government, nor our mothers, not our instructors and not even our buddies who are responsible for our safety. In the final analysis, the buck stops with us—individuals with free will to make a decision and accept the consequences. If you choose to dive solo, please do so only if you’re truly self-reliant and follow the appropriate guidelines. To do otherwise is foolish. If you choose to dive with a buddy, then don’t fall into the trap of assuming all is well just because someone is accompanying you. No procedure nor any technology on the face of the earth can replace a functioning human brain. Use it and dive safely.